China’s rise is only the most remarkable of the many extraordinary stories of Asia’s emergence, says Jason Miks in the first in a special series of essays on the Asia-Pacific’s future. The sleepy town of St. Austell in the British county of Cornwall wasn’t quite where I expected to hear the world being put to rights. But over a traditional English breakfast in a small bed and breakfast this summer that’s just what I overheard. “I don’t think we have a very good future. We just can’t compete with them,” lamented one woman, who I guessed was in her late 60s. “I know. We don’t spend anything on training, on apprenticeships. So they send the jobs there instead,” replied her companion. “Them” were the Chinese. “There” was China. And, even in what seemed like the middle of nowhere, the extraordinary rise of the People’s Republic apparently looms large in people’s consciousness. Everyone, it seems, has an opinion on the Middle Kingdom, and more often than not when I speak with people about China, it’s with a sense of resignation and worry that they explain their take on what its rise means for their country. Why? It wasn’t just because of China’s growing military prowess, although war-weary Americans appear to be fully aware of the limits of what even the most powerful armed forces the world has ever seen can achieve. More, it was a sense that somehow, as stories of how the United States’ increasingly rickety infrastructure is crumbling proliferate, and as unemployment remains stubbornly close to double-digits, that the center of global economic gravity is shifting eastward. And they’re right, of course. Decades of remarkable economic growth mean Asia now accounts for 27 percent of global GDP, according to the Asian Development Bank, which expects the region’s share to increase further still – to half the global total in 2050, at $148 trillion. But just as China’s increasing dominance on the global stage marks a return to a position it held centuries ago, so Asia’s growing share of global wealth marks a return to the past. After all, in the middle of the 18th century, Asia accounted for 58 percent of the global economy, a share that gradually slid as the West underwent its Industrial Revolution. Rapid development in the West saw Asia’s share of GDP tumble to around 15 percent by 1952. In a very real sense, then, what we’re seeing isn’t so much extraordinary, but getting back to the ordinary. Yet this two century swing away from Asia, and the single century swing back, masks some perhaps even more remarkable numbers. And China, as the West Country breakfast conversation underscored, is arguably responsible for the most remarkable numbers of all. The raw figures for what is now the second-largest economy in the world speak for themselves. Guangdong Province, the most populous and richest province in China, had a gross domestic product of $665 billion last year, meaning that if it were a country, it would be one of the 20 largest in the world in terms of GDP. 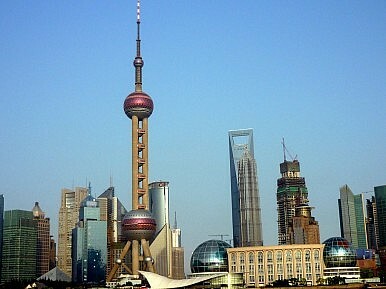 If the same calculation were done for Shanghai, China’s most dynamic city would be the 34th largest economy in the world, placing it ahead of Finland. Thirty years of double-digit growth have lifted by some measures about 500 million Chinese out of poverty, in the process providing enough disposable income for 900 million – nearly two thirds of the population –to own a cell phone. So is the rapid development that economic reforms have unleashed all thanks to a Communist Party master plan? Gordon Chang, in our first essay, thinks not. Chang concludes with a statement that rings true for anyone that has visited China, and certainly anyone that has visited the country more than once and witnessed the breakneck pace of change – “In China today, almost anything is possible.” And this increasingly includes, it seems, an ability and desire to reach for the stars – quite literally. At a time when the United States has retired the last of its iconic Space Shuttle fleet (leaving it with no homegrown means for getting its astronauts into orbit), China is becoming increasingly bold in its stellar endeavors. As David Axe notes in the second essay in our series, last year marked the first time since the mid-1990s that another country had matched the United States in sheer number of successful rocket launches. That country, of course, was China. And it has continued to go from strength to strength. Chinese achievements in space in recent years have included the launch of its first unmanned lunar orbiter, Chang'e-1, in 2007, a third manned Shenzhou mission and a spacewalk. Future plans include a manned lunar mission in 2017. The problem in U.S. eyes is that there’s more to China’s interest in space than advancing scientific understanding. Many argue that walking hand-in-hand with China’s civil advances in space is the People’s Liberation Army. Certainly, China’s killing of a weather satellite in January 2007 has only stoked such fears. The destruction of China’s polar orbit satellite, more than 500 miles above the Earth’s surface, was the first known successful satellite intercept test since the United States did something similar in 1985. In technological terms, it was a remarkable achievement. But it was also one that drew widespread international condemnation, not least because of the mass of debris that resulted from the destruction of the satellite. The Chinese were quick to claim that the test didn’t represent a threat, and was by no means a statement of its intentions. But to many in the United States and elsewhere it seemed exactly that. But as leading China scholar Minxin Pei notes in his essay, “just as the decline of American influence in East Asia appeared to be an iron-clad fact and an irreversible trend, something remarkable happened.” What exactly? According to Pei, it was a combination of deft diplomatic maneuvers and Chinese mis-steps that allowed the United States to once again reassert its influence in the region. That U.S. influence was indeed waning, Pei and many others are in no doubt of. The Chinese dragon had embarked on a patient charm offensive, with its officials paying numerous visits to neighboring capitals and lavishing key countries with promises of investment. In 1997, the United States was the biggest trading partner for all countries in East Asia. But by 2009, China had become the largest trading partner for the Association of Southeast Asian Nations, Japan, Taiwan, and South Korea. That first year Pei selected wasn’t plucked out of the air. It was the year of the Asian financial crisis, which started in Thailand before going on to tear through the region, prompting fears of a global meltdown. As many Chinese officials see it, the event was a watershed in China’s relationship with the region. As stock markets around the region came under pressure, China earned praise for refraining from devaluing its currency, as well as for the aid and loans it offered to ease the pain of its neighbors. It marked a shift from hard to soft power, and much ink has been spilled on the many manifestations this approach has come in – from big dollops of foreign assistance to countries such as Laos and Vietnam, to the signing of the Treaty of Amity and Cooperation in Southeast Asia, to the proliferation of Confucius Institutes – all wrapped up in non-interference packaging. But if 1997 really was a watershed, why did it take more than a decade for the United States to respond to China’s diplomatic advances in the Asia-Pacific? It’s hard not to think that the distraction of two enormously expensive wars played a role in the United States taking its eye off the ball. The conflict in Iraq and all its rights and wrongs is beyond the scope of these essays, which are focused firmly on the Asia-Pacific. But even the so-called “good” war, namely the conflict in Afghanistan, has had profound implications not just for U.S. policy in Central and South Asia, but also for the broader Asia region.